Altitude range: 0–1160 metres above sea level. Habitat and ecology: Pterodiscus ruspolii is locally common in lowlands and medium altitude semi-desert scrub or dry grasslands. Pedalium ruspolii var. aureus Chiov. Description: Pterodiscus ruspolii is a caudiciform plant with numerous herbaceous erect annual stems up to 20 cm tall, growing from a fleshy sub-spherical tuber, up to15 cm long. This species species is remarkable for its yellow-orange funnel-shaped flowers sometimes with a darker red or purple-violet centre spot, opening 2–3 at a time. It is an exceptionally beautiful species. 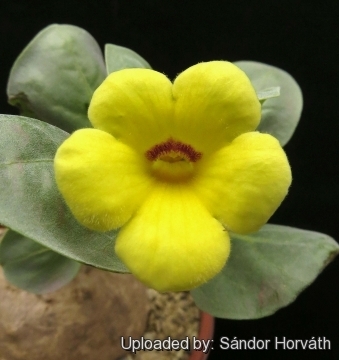 Derivation of specific name: This species was named after the Italian nobleman, explorer and plant collector in NE Africa Prince Eugenio Ruspoli (1866–1893), killed by an elephant in Ethiopia. Rootstock (caudex): Pale brown, toberous, turnip-shaped to slender, 4–8(-15) cm long, consisting of a swollen aerial stem up to 0.5-3 cm in diameter arising from a subterranean tuber of approximately the same diameter. Annual stems: Up to 20 stems, erect, ascending from the base, later in the season decumbent, 4-30 cm long, usually with minor lateral shoots, giving the plants a bushy appearance, glabrous, base of main annual shoots often somewhat lignified and persistent. Leaves: Opposite, fleshy, variable in shape, oblong, ovate or obovate-spathulate, obtuse or rounded at the apex, quite entire, narrowed from the middle to the petiole, clothed, especially beneath, with pale grey glands, glabrescent above. The upper leaves (1.5–)5–6.5(-10) cm long,(1.5–)3.5-4(–8) cm broad, occasionally even larger, the lower smaller. Margins distinctly entire or slightly wavy, with scattered mucilage glands on the lower side. Petiole usually clearly separated from the blade (0.5–3.5 cm long). Flowers: Solitary in the axils of the upper leaves. Pedicels 2-6 mm long, glandular. Calyx-tube short; lobes linear-lanceolate, very acute, c. 2 mm long. Corolla 1.5–2.5 in diameter, various shades of yellow to orange, pubescent near the centre the throat usually with a red or purple blotch or streaked with purple-violet. Corolla-tube cylindrical to funnel-shaped, straight or slightly curved, oblique at the throat, nearly 1.6–3 cm long, 3–4 mm in diameter, violet, with hairs in the upper part particularly in the throat. Corolla lobes bright yellow to orange, half as long as the tube, more or less transversely elliptic to suborbicular or obovate, 6-10 mm long and 10-15 mm broad, often ciliate, the lowermost lobe slightly enlarged. Filaments bearded at the base, the 2 longer pubescent throughout, about 7 mm. long. Ovary ovoid or oblong-ovoid. Disc conspicuous. Fruits: Leathery, not woody, elliptic to nearly circular in lateral view, rarely transversely elliptic, 4-winged, 2.7–5.3 long, 1.7–6 cm broad, only moderately laterally compressed, tardily dehiscent, body elliptic, beak triangular, very indistinct, wings 3–20 mm wide. Similar species: Pterodiscus ruspolii is similar to to the narrow-leaved Pterodiscus kellerianus, but narrow-leaved plants of P. ruspolii are known in SE Ethiopia making difficult to discriminate between these two species, but generally P. ruspolii is larger in all parts. 6) J.O.Kokwaro. “Medicinal Plants of East Africa” Third Edition. Nairobi: University of Nairobi Press. 478 Pp.Nairobi: University of Nairobi Press. Pp. 223. 2009. Cultivation and Propagation: Pterodiscus ruspolii is a caudiciform plant that grows relatively easily and doesn't produce as many stems and leaves as other caudiciforms, making its management easier. 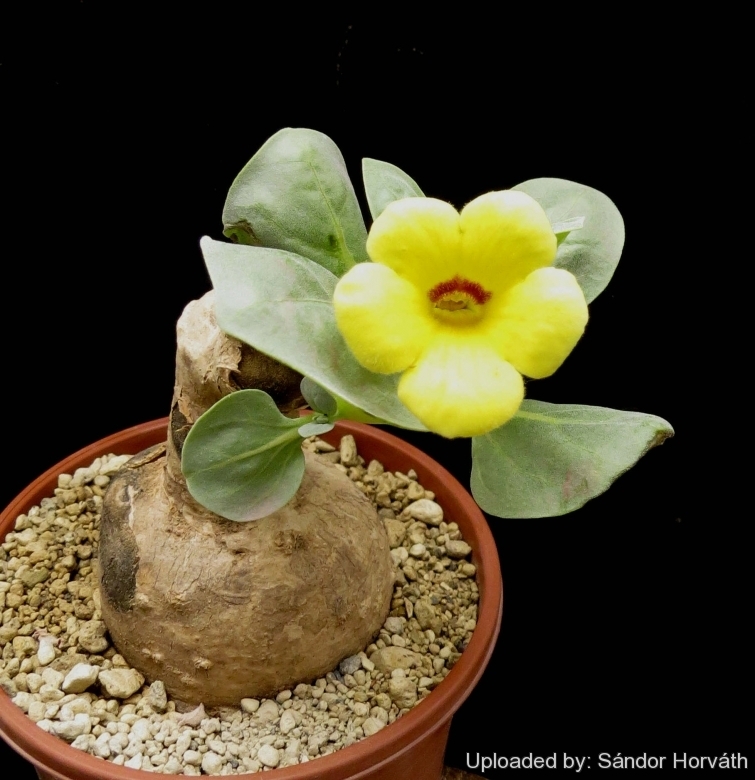 The caudex generally underground in the wild is often raised in cultivation. Growth rate: It grows well, though very slowly, but it possible to increase the speed of growth to some extent by providing adequate amount of water, warmth, and fertilizer during the active growing season, but it’s susceptible to rotting if too wet. Potting medium: Since roots are quite succulent, use a slightly acidic cactus mix or add extra perlite, vulcanite or pumice to regular soil potting soil. A gritty, very free-draining compost is suitable, and clay pots help the plants to dry out between watering. It like pots with generous drain hole, re-pot every 2 years. Frost tolerance: Due to its African origin keep warm in winter, the minimum safe average temperature is 5°C, although it can go lower for short periods. It can be grown outdoors in frost-free climates, need anyway to kept above 0°C and dry in winter. Exposition: It likes a sunny position, but avoid direct blasting sun in summer. Keep the caudex in the shade. Watering: It should be watered regularly when it begins to produce leaves in spring/summer and kept drier in Winter. Like most caudiciform it likes lots of water during warm and hot weather, and is accustomed to growing under other plants. Make sure after watering, that the soil is actually wet. Many potting soil mixes will have only the surface wet, with water running down the outside of the root ball, and most of the soil dry. Run your finger into the soil 15 minutes after watering to check. Too high or too low temperature will induce dormancy. Traditional uses:An infusion made from the whole plant is given to cows to remove retained placenta after delivery. Maintenance: Repot every two years. Propagation: The mode of Propagation is by seed.